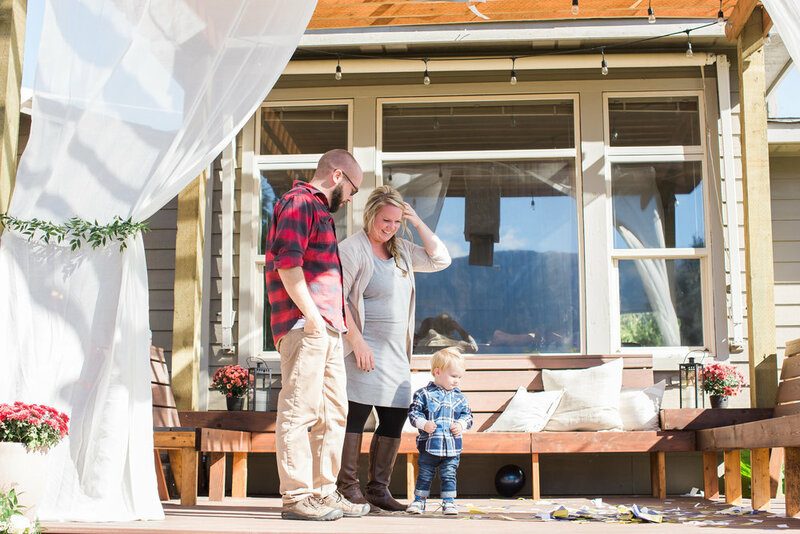 It's true, our little family is growing, and we are expecting Baby Number TWO! We couldn't be more thrilled!! 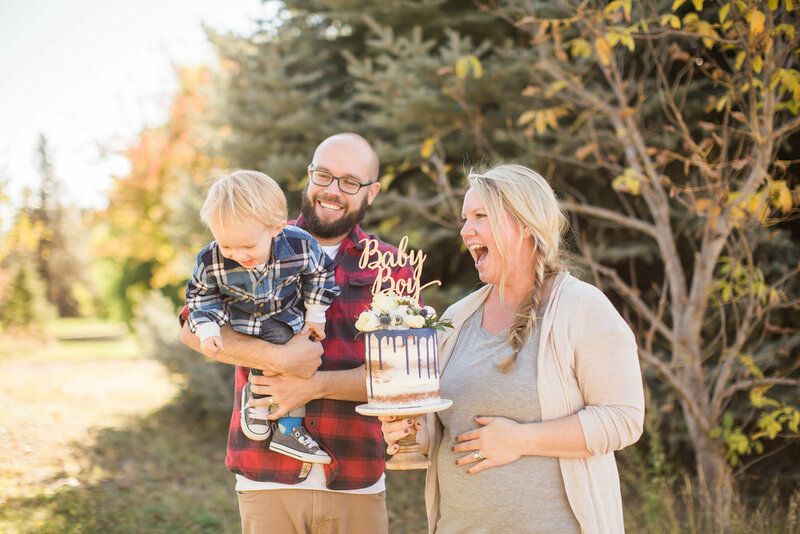 To celebrate, we decided to have a gender reveal party! 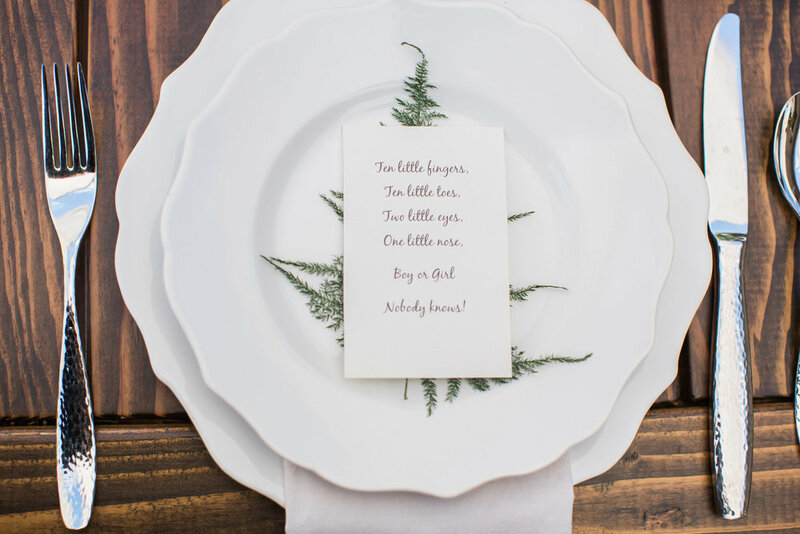 When I first started planning the party, I came across the sweetest invitations from 101 Pretty Designs. I was instantly smitten, and was drawn to the navy blue and blush pink colors with the touch of gold. 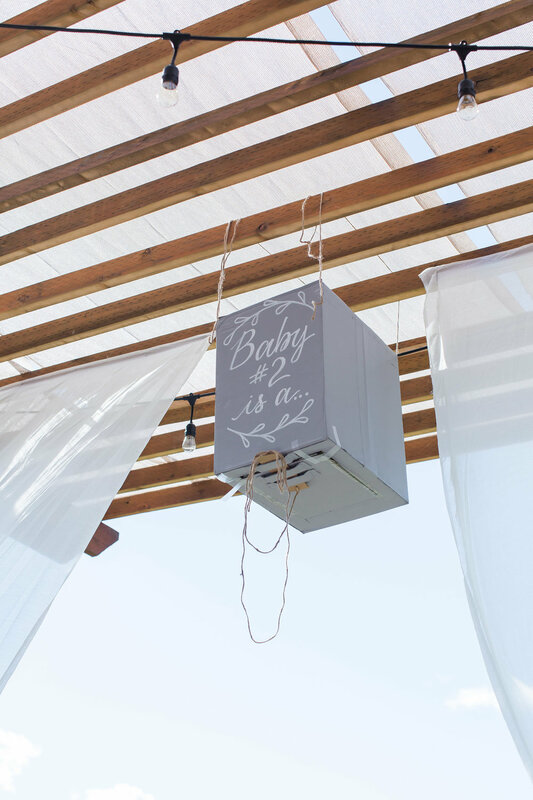 I knew I wanted to do something a little bit different than your normal pink and blue used for most gender reveal parties, and this was it! From the invitations, I decided on a color palette of navy blue, blush pink, & gold - tied in with soft neutrals of whites, creams & grays. 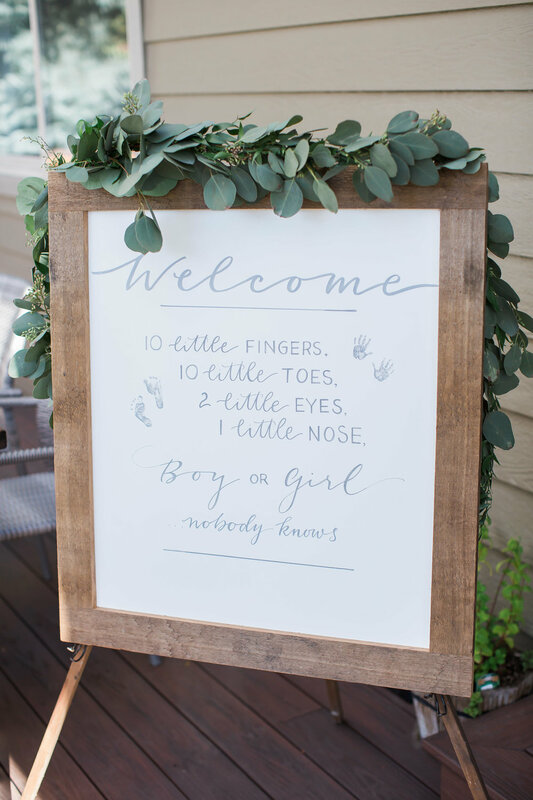 Upon arrival, guests were welcomed with the sweetest little saying written out beautifully by Chalk Chic Mama on one of our newest chalkboard rentals that my darling husband Aaron had just built! 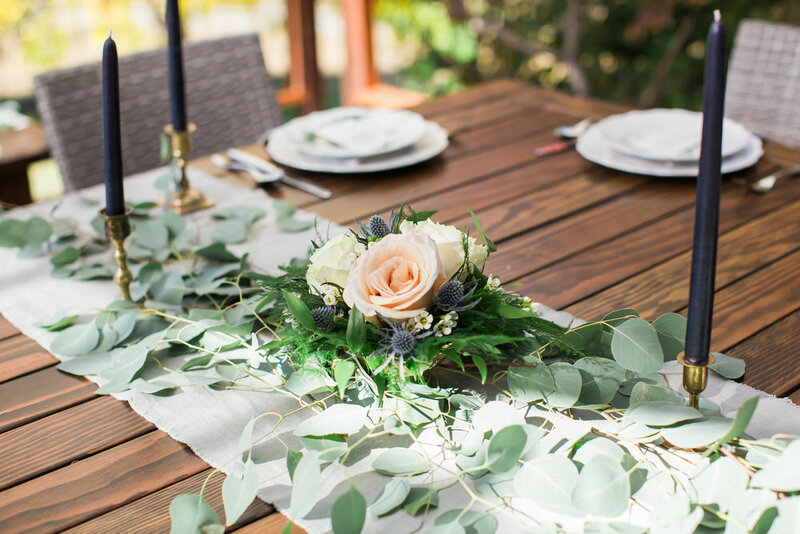 I added the charming eucalyptus garland from Full Bloom Flowers & Plants that we had used earlier that morning on our canoe - for our baby announcement pictures! It was the perfect touch. 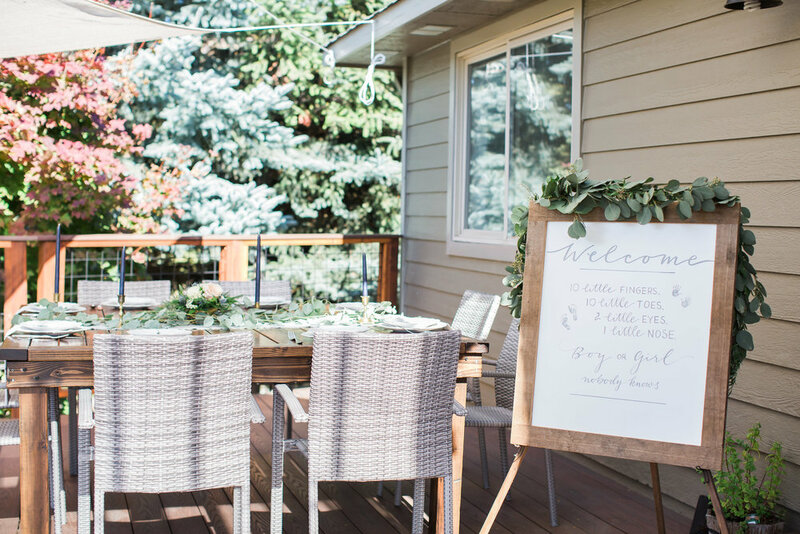 Even though we were a few weeks into Fall, the weather had been really nice and I was dying to have one more party outside on our new deck (or "Party Deck" is what I like to call it! 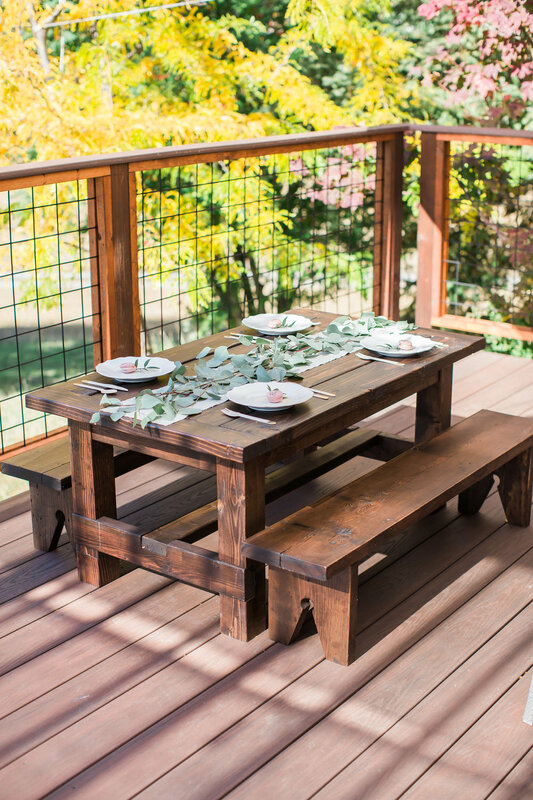 :D It is a large, 2-level deck that has a beautiful giant arbor above one part with built in bench seating - perfect for parties!) that Aaron had just finished earlier this summer. 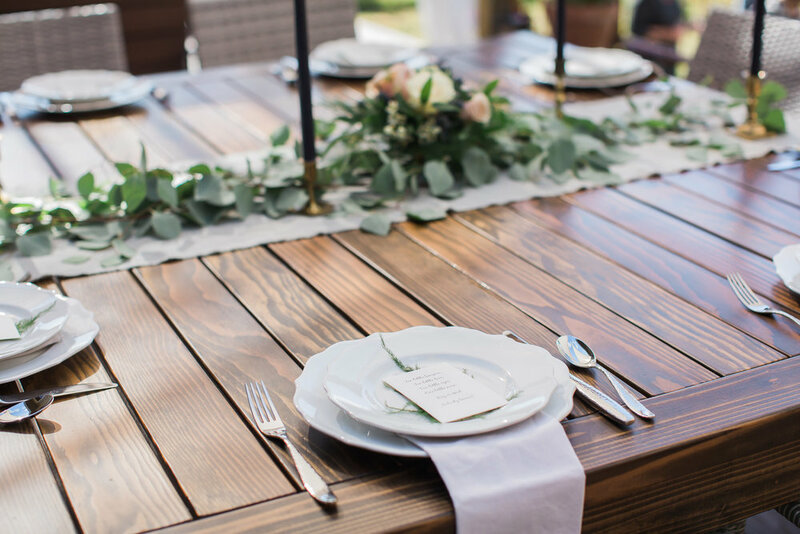 He also built our gorgeous outdoor dining table & kids table and bench set that worked superbly for the party! I found some soft gray linen fabric from my local Jo-Anne's store and made runners for each table. 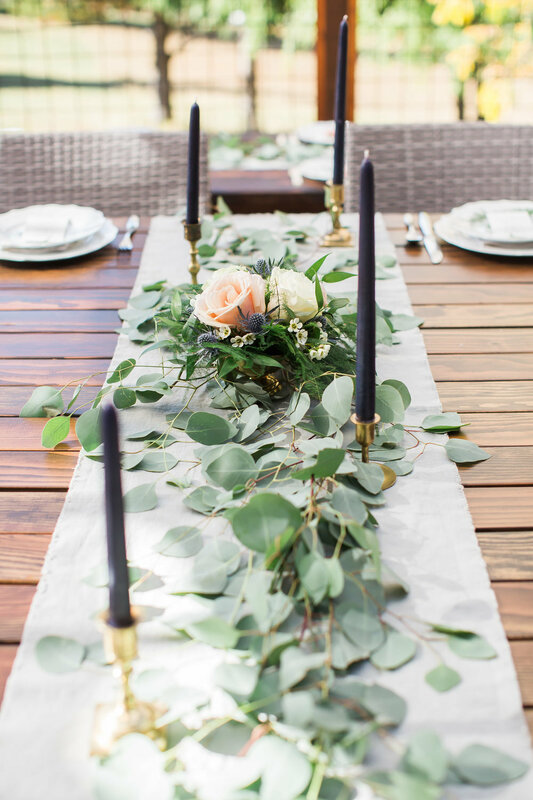 Eucalyptus leaves adorned each runner along with beautiful navy blue candlesticks - which tied in perfectly with my color pallet - and I found them here in town at The Candle Connection! 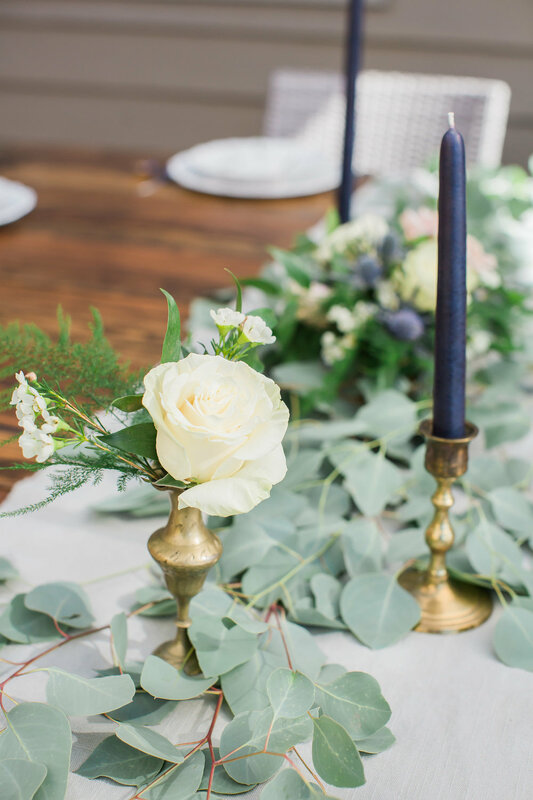 They added a simple, yet elegant touch, and they gave me all the heart eyes in our brass candlestick holders. 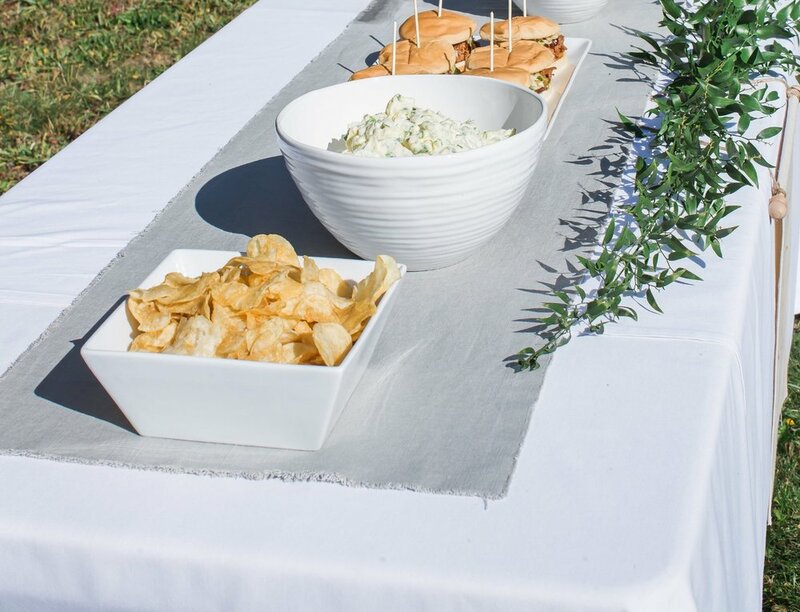 For the children's table, I wanted to keep it simple - along with the adults table - and used the same gray linen runners with eucalyptus & white scalloped plates. 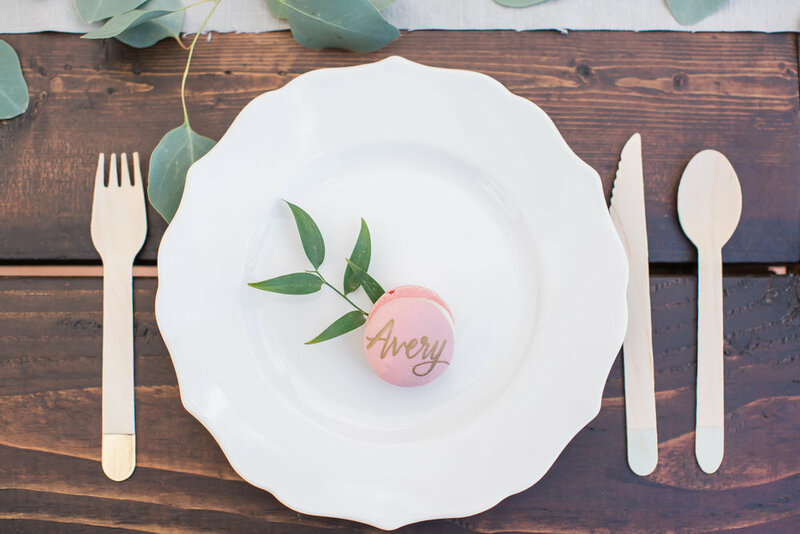 I added cute wooden utensils with touches of gold, and each place setting had a blush pink macaroon that Chalk Chic Mama sweetly embellished each child's name on. 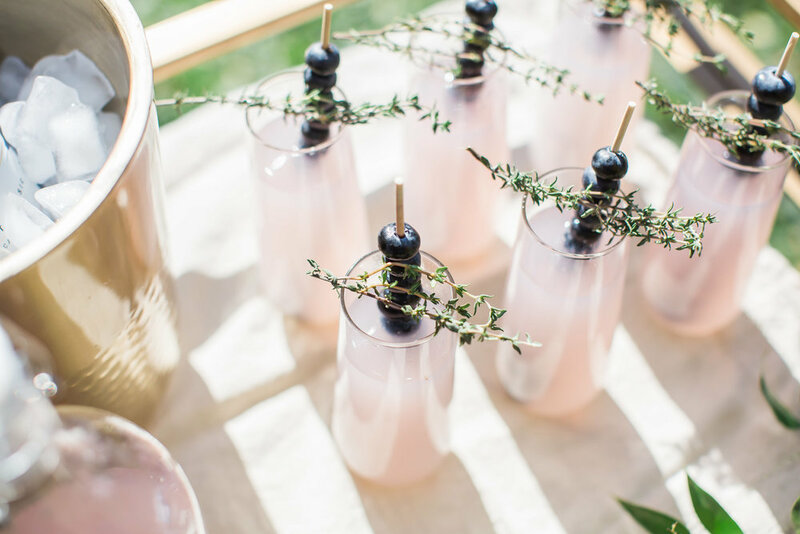 Arranged on the bar cart were blueberry thyme non-alcoholic spritzers. They were not only delicious, but tied in perfectly with our color pallet. Guests then had the option to add champagne if desired. I had some leftover duck cloth canvas from a previously styled event - so I decided to sew some banners for the bar cart and the food table. 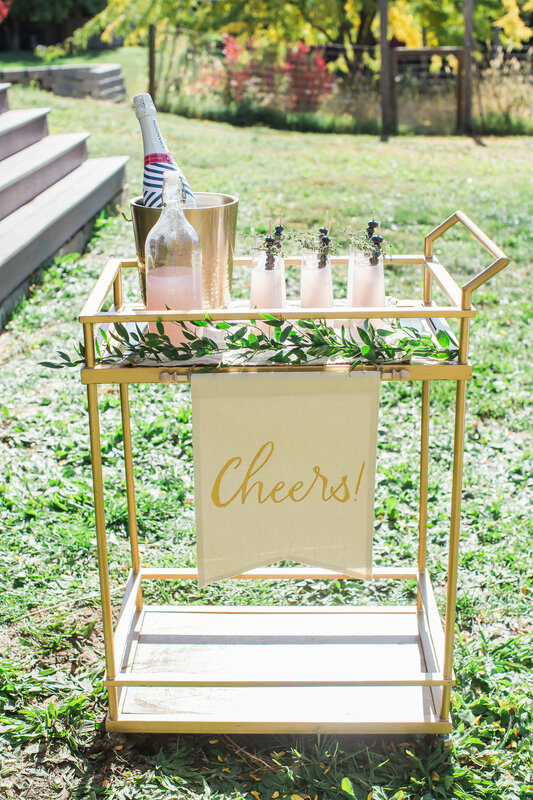 Chalk Chic Mama charmingly enhanced each banner by hand painting in gold "Cheers" and "Let's Eat". They were too cute! For the food I had been craving pulled pork a lot this summer, and so my wonderful brother Brad whipped up a delicious lunch for all of our guests. 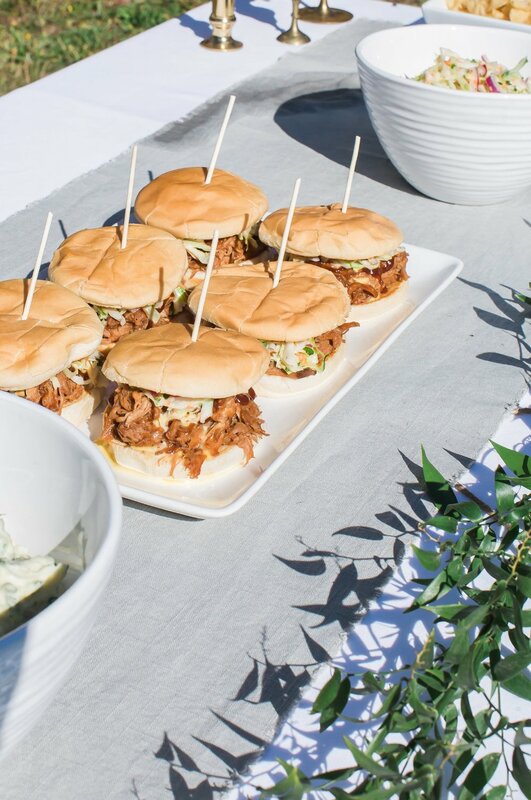 We kept it simple with the pulled pork sandwiches as the main course, and offered a few sides of homemade potato salad, coleslaw, and kettle potato chips. 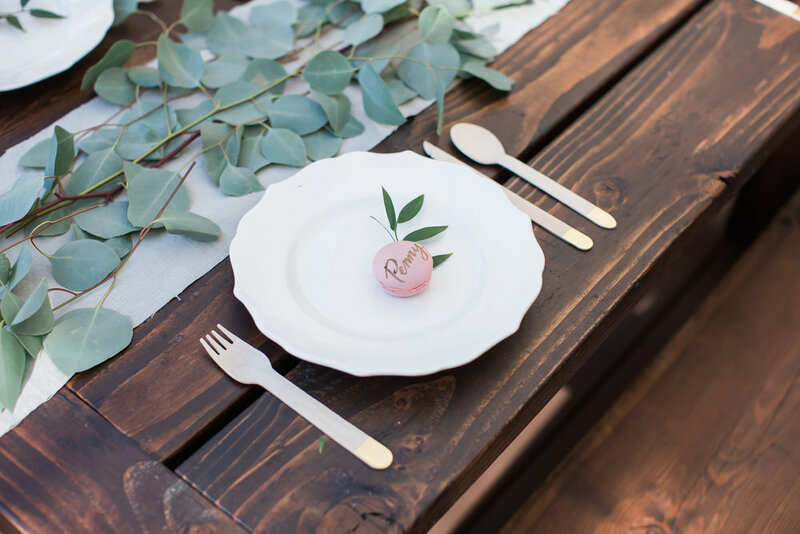 set against our new rustic white wood backdrop. 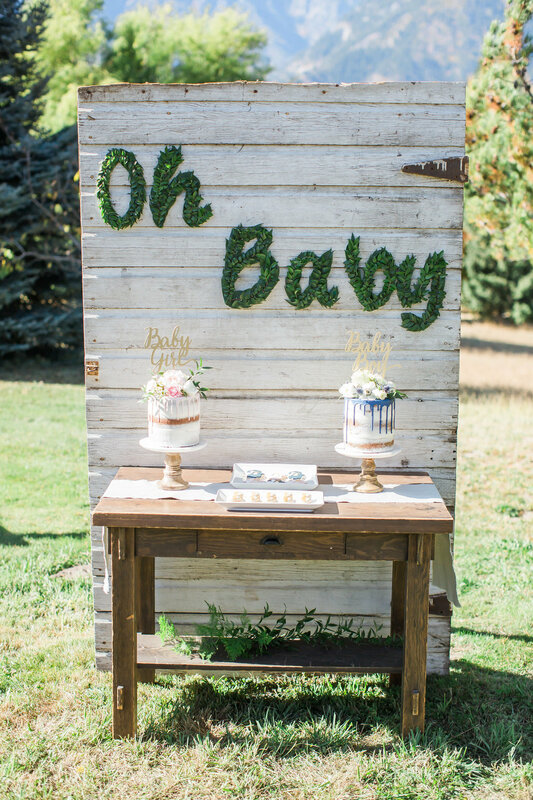 Not knowing whether or not we were having a boy or girl, I decided we needed two cakes for the dessert table! The beautiful and delicious vanilla bean naked drip cakes were from Jenny Cookies Bakeshop. 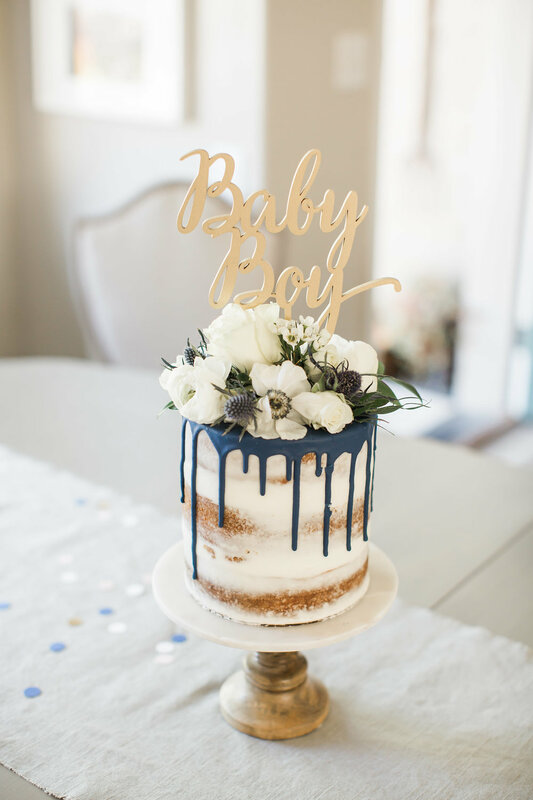 Adorning each cake, and adding a touch of gold to the dessert table were the most darling cake toppers from Now Let's Party. 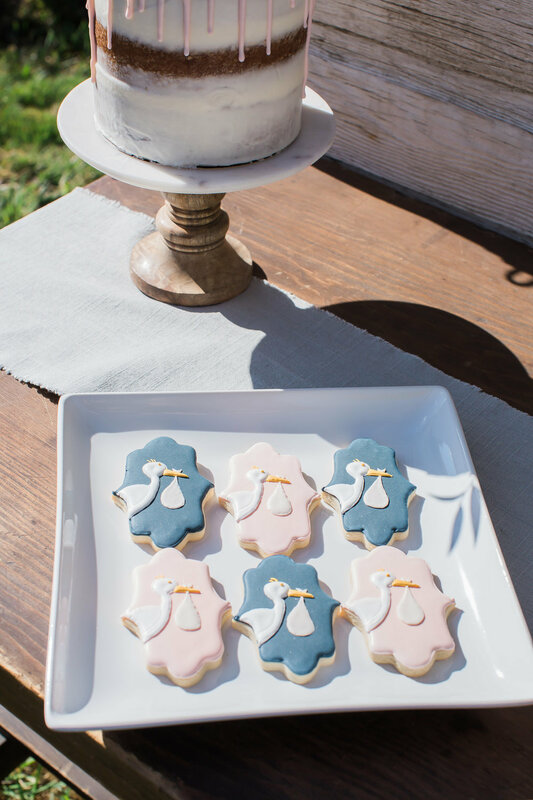 We also had the most adorable stork cookies made by Stefanie Rosales - that were almost too pretty to eat! Now onto the reveal! We had made our own gender reveal box from a tutorial that I found online. I cut out a door, taped up the rest of the box, and then painted it a nice neutral color. Josie from Chalk Chic Mama then beautifully hand wrote a description on the box reading "Baby #2 is a...". After we hung the box, we ended up needing to reinforce it a little bit more with tape - not wanting to ruin the surprise! At first we tried to let Avery pull the latch, but he couldn't do it. Aaron then pulled it, and NOTHING happened! He then lifted Avery up to try to pull the door open, and he couldn't quite reach it! Aaron then had to grab a broom to help open the door. The suspense was killing us! We are having another Boy !!! We are ecstatic for Avery to have a little brother!! Sweet baby boy, we can't wait until your arrival! A huge shout out to the most wonderful vendors!